Storybook Wars Hero of OZ: Dorothy. She is ready to take on the witches or anything else that gets in her way on the yellow brick road. She wears a helmet, boots, short dress and fires a 45 pistol. In her basket she carries an assortment of grenades and her little dog too. Copyright JLB Studios LLC. All rights reserved. Prices subject to change without notice. Click on item image for description. Some figures require assembly, parental supervision required. Not for children under 14. -------- Warning Parts can be a choking hazard for children under 3 ---------- Figures are sold unpainted and some figures may require some model building skills. Products in the Victory Store may be shown in photos assembled, painted, primed, or black washed, this is for store photo display purposes. All products are shipped unassembled, unpainted, unprimed in their raw pewter state. 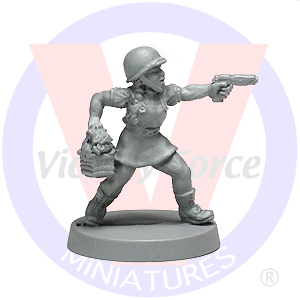 VFM figures are suitable for most 28mm-33mm gaming.